The Pavilion (Pafiliwn), sometimes irreverently referred to as the Big Top, has a capacity of 4,000. 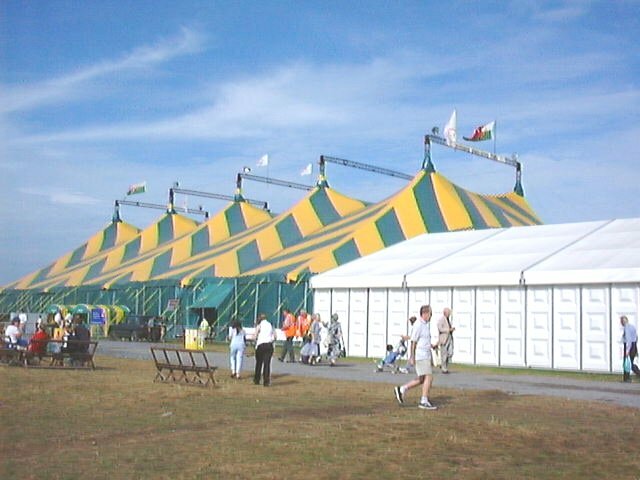 It provides the venue for all the big Eisteddfod ceremonies, such as the Crowning, when, after a lengthy judges adjudication, the Chief Bard calls upon the winner, if he should be here present, to rise to his feet and make himself known. Spotlights begin to probe the auditorium for him. Luckily he always is present, and when (after a suitably theatrical pause) he stands, a deputation from the Gorsedd make their way to him, clothe him in a dark blue robe and bring him up onto the stage, accompanied by solemn organ music. Cheesy? You bet. But it works every time.